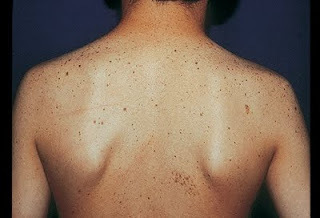 Multiple lentigines syndrome is a disorder that derivatives can be identified with an increased number of lentigines (like spots). Affected persons have lentigines as the most obvious sign. This is largely located on the back and neck. Affected people also have wide-set eyes (hypertelorism), prominent ears, nerve deafness (partial), and cafe-au-lait spots (light brown birthmarks). Symptoms can diketauhi of family history who developed lentigines, freckles on the neck, wide eyes (hypertelorism), abnormal sternum or breast bone, slow growth and delayed puberty. Treatment is directed at symptoms. The level of hearing loss should be prioritized and provided a hearing aid. Other treatments may be related to puberty to normal towards the changes that occur.